This is excellent information, thank you very much! Many thanks for your photos and the type info. 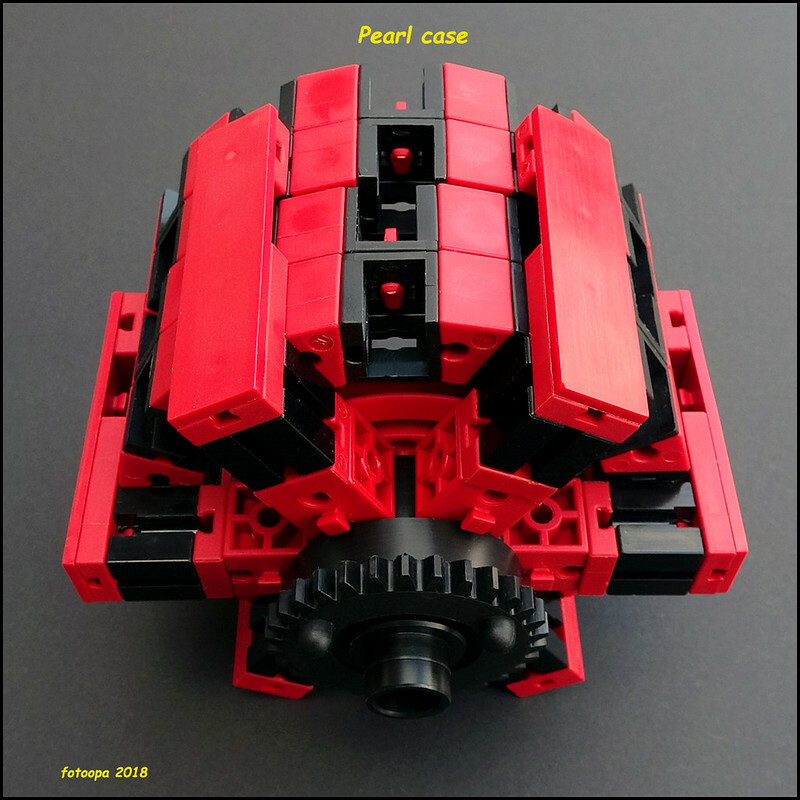 I'm sure this will help others, who are also puzzled by the unexpected gear ratio. ft could have just enclosed to their building sets a small sheet informing about this change, mhm. I'm still a bit puzzled by the large prime in your measured 76 1/6=457/6 ratio. I guess there exists a three or four stage gear combination 3 * a/b * c/d * e/f * g/h resulting in a ratio very close to 76.1666. But who cares as your measured ratio works out nicely. hamlet hat geschrieben: I'm still a bit puzzled by the large prime in your measured 76 1/6=457/6 ratio. I guess there exists a three or four stage gear combination 3 * a/b * c/d * e/f * g/h resulting in a ratio very close to 76.1666. But who cares as your measured ratio works out nicely. With my latest tests I am almost sure that the right ratio is closer to 76,166666. With this value, my own hardware quadrature encoder no longer gives an a deviation even after 30467 pulses on the FT motor 135484. FT would indeed give some more information, you still need it to determine your distances. I think Fischertechnik scores very poorly on giving elementary information. Still, I think the TXT Controller is a great device. Especially the Robo Pro software and the TXT Controller allows you to create an HMI interface via your PC. If you use a UHD screen, a lot of information details will fit on it. The transfer of parameters over an I2C connection then allows me to solve all the problems that are too slow on the TXT controller itself. It's high time now I made my new project with the colour pearls. 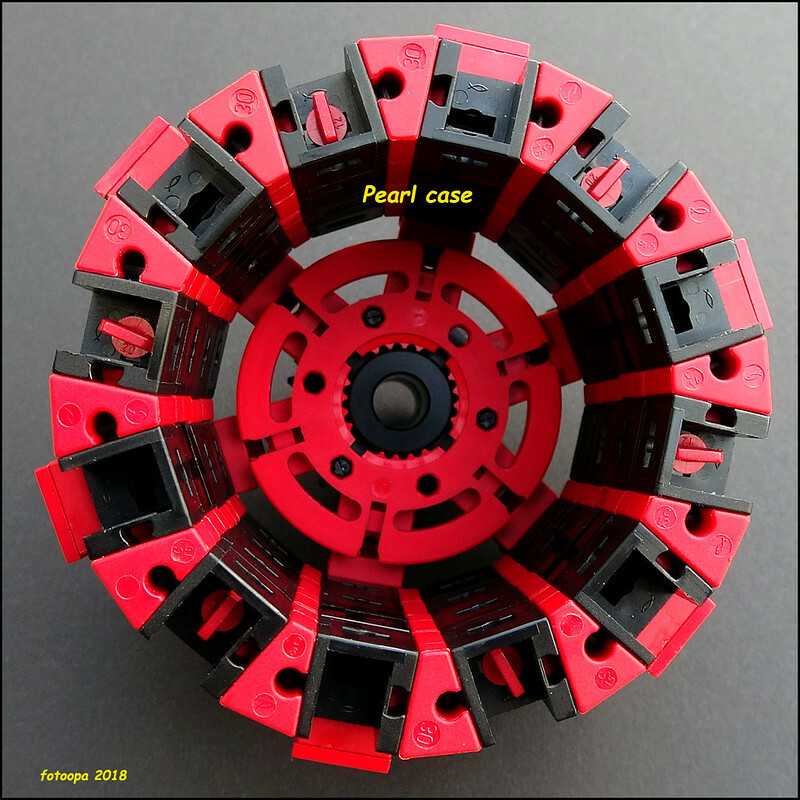 This is in the first place a mechanical problem, how to guide the pearls to a point for the color measurement. The color selection process must then be completed smoothly. Today I also opened an XM motor. Of course there is no encoder on it, but the PCB is just the same. In both cases, the PCB "layout" is provided with but not present with a real quadrature encoder, i.e. with 2 hall detectors. For the encoder connection, 3 or 4 pins are provided, to be fitted according to motor model. 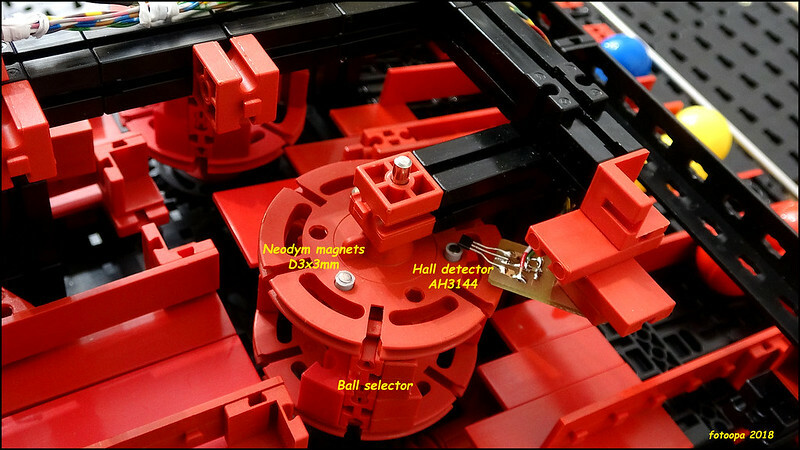 There is no magnetic disk on the XM motor. Only the 075F fuse is present. There was no mark of the type of motor used. One last measurement to accurately measure the encoder pulses of the FT135484 motor. I have brought all the encoder signals to my FPGA hardware and run the motor 10000 revolutions. My own hardware quadrature encoder with 40 pulses / rotation indicated 400,000, the FT measured pulses via an input to the FPGA indicate 761716 pulses. This gives me a very accurate measurement of 76,1716 pulses/revolution. The ft motor was running at full speed without load and took a little more than 30 minutes to measure. Here's the start of my new project to sort 10mm color pearls. 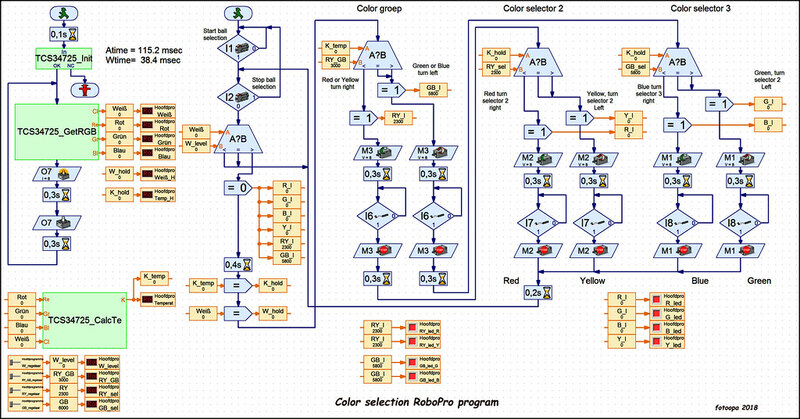 This is the test setup for measuring the color via an I2C sensor module TCS34725. I still have to make the feeder for the pearls. My first tests for this were not good. But I'm now working on a chain version and it will probably work. The color recognition works well. If I can now supply the colour pearls correctly, I'll have to succeed. The user has to choose a color and the number and the right pearls have to fall into a tray, the others have to go back to the feeder. There is still a lot of work to be done, but I think it will work! The sorting of the color pearls doesn't go well because I can't apply the pearl correctly in the measuring unit. That is why I decided to stop this project momentarily. 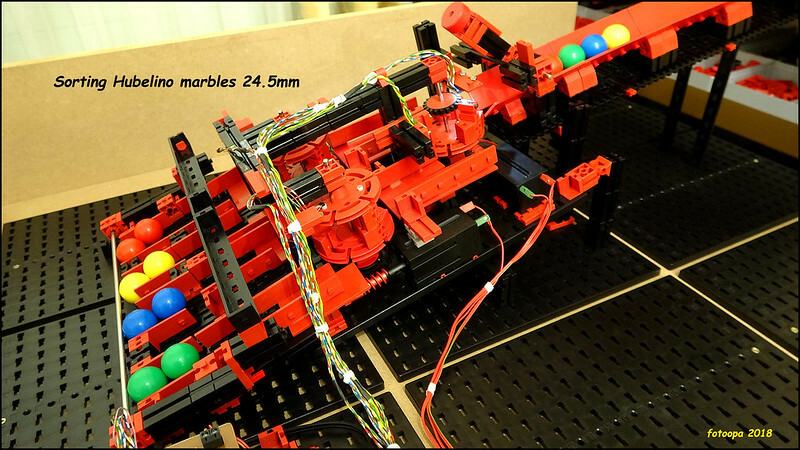 Meanwhile, I started another project to sort colored balls from a Hubelino marble run. These balls have a diameter of 24.5mm and consist of 4 colours. You can buy these balls separately. Herewith the first images of the measurement setup for sorting. I use the TXT Controller with the Robo pro software and the available I2C interface. 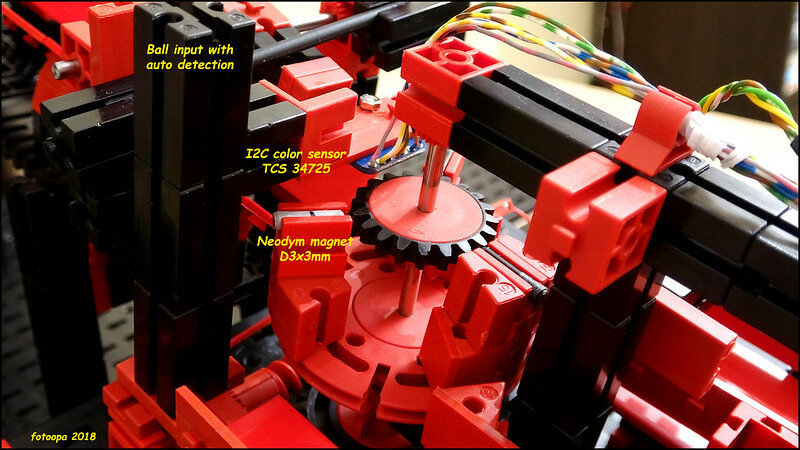 The color sensor module is the TCS34725. For the color measurement I use the color temperature value and the white value. These give a clear distinction between the 4 colours. As a basis for the software I partly use the example of Dirk Fox. 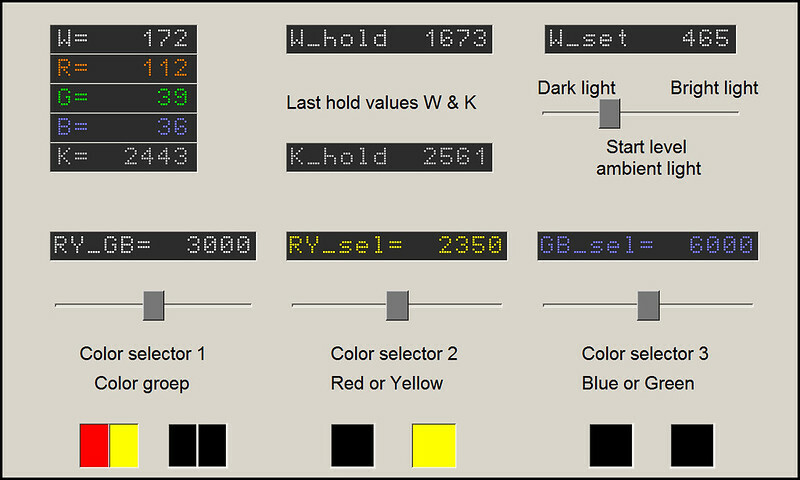 You can select perfectly via the colour temperature and the white value see the value for the 4 color balls. I use the LED of the module for the exposure and the integration time is set to 16.8 msec. I am now working on a complete set-up. As soon as it's finished I show additional images and a video. My Hubelino color marble selector works. The basis for color detection has been taken from Dirk Fox's example. Only in the init routine I added 2 registers to set the A_time (reg 0x81, 0xd0) and the W_time (reg 0x83, 0xf0). 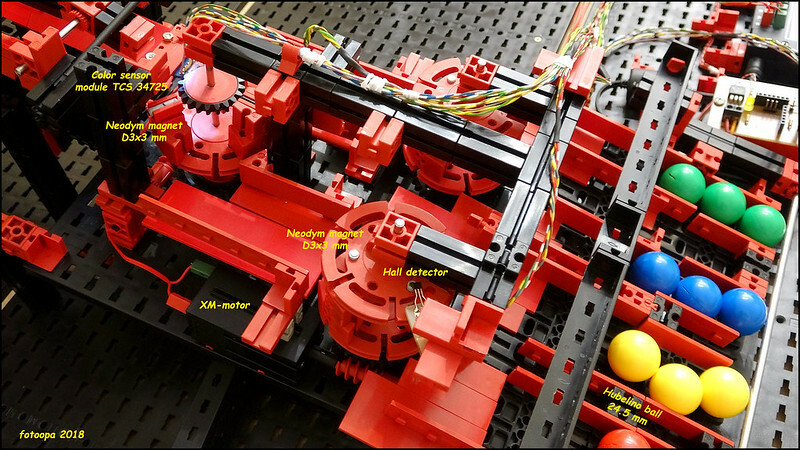 The coloured balls are selected via 3 XM-motors. 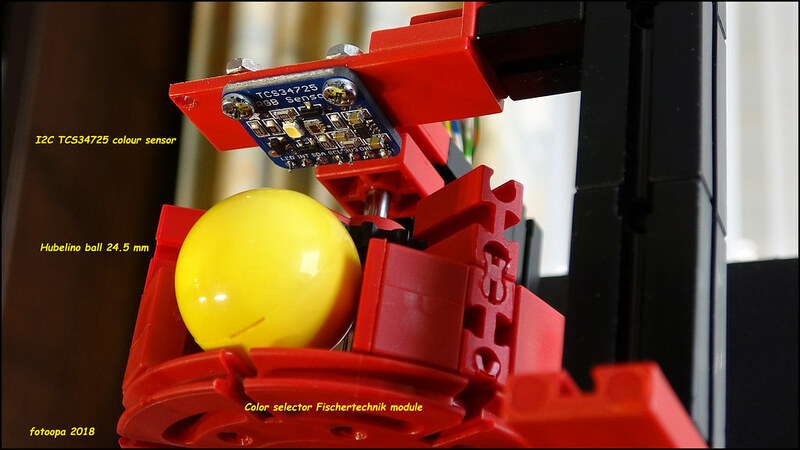 The light value W of the sensor is used to detect a ball. As soon as the light value is above an adjustable threshold value W_set, the sorter is started. There are 3 additional color settings to realize the color selection. The last used value of W and K will be displayed on the screen via W_hold and K_hold. These values are useful for making the settings. The value W_set for the light environment is particularly important. This setting value sometimes needs to be adjusted in case of large ambient light changes. The color temperatures are more stable and should not normally be adjusted. PHabermehl hat geschrieben: What a show, man!!! I am looking for a new project now. When a project is finished it is demolished to build something else. Given my age, it's just about staying busy. What do you think about a Stepper motor driver comand and control via I2C including 32 microsteps for smooth operation (which needs a very high frequency at high speed timing). Extra feature would be step loss detection and current adaptation. 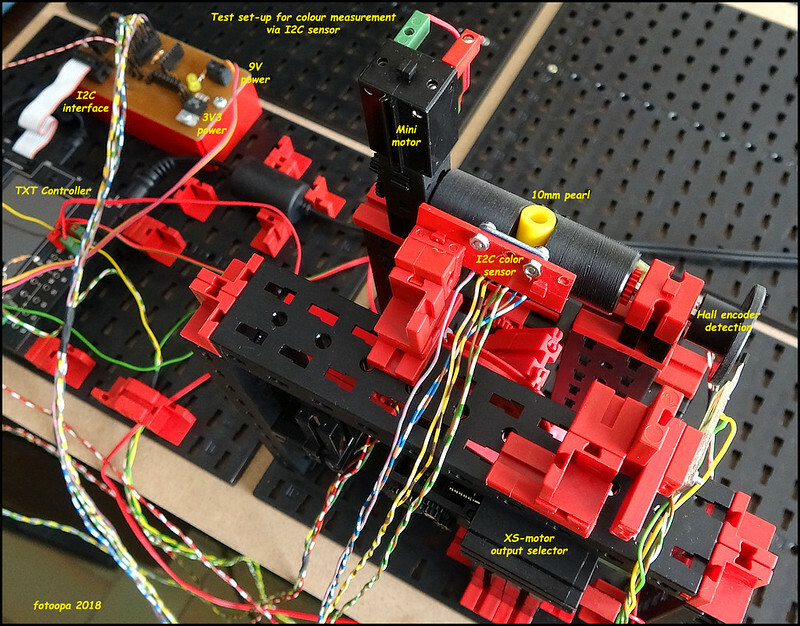 chehr hat geschrieben: What do you think about a Stepper motor driver comand and control via I2C including 32 microsteps for smooth operation (which needs a very high frequency at high speed timing). Given the limited speed of a TXT Controller, you should place the real work in the I2C module/stepper. However, the screws of Fischertechnik are not so accurate (FT 37926) and especially the nut has a lot of backlash (FT 37925). That is why I have a little doubt about the usefulness of such an application. It would still be a fine challenge. 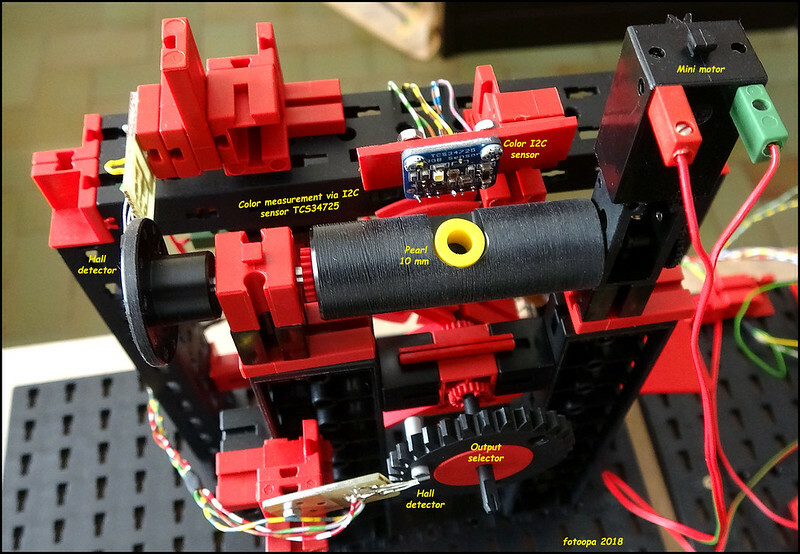 I am researching the Adafruit Motor/Stepper/Servo Shield for Arduino v2 Kit - v2.3 module to test servos, motors and steppermotors. Soon I will order such a module to be able to evaluate. For the stepper motors it's not clear to me how you should put in a distance. Especially taking into account the slow operation of the TXT Controller. I have no experience at all of this. Time may bring a solution. I am going to order a small steppermotor too to make tests. I am now studying the PCAS9685 chip. I know the TB6612 chip, as I use this chip on my FPGA board. 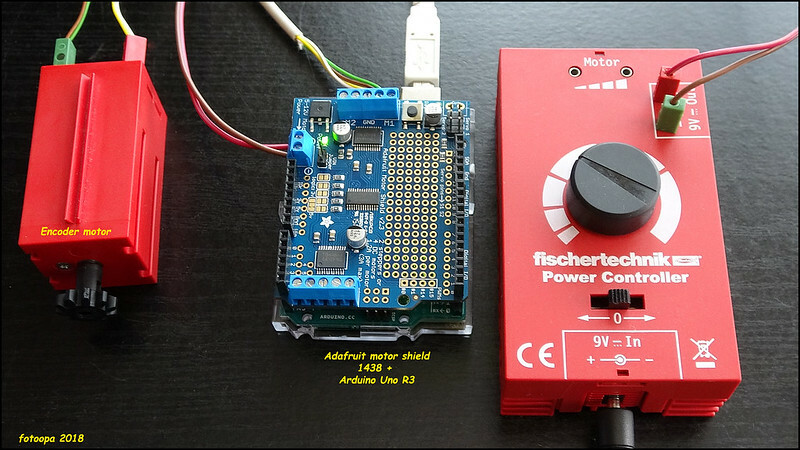 The motor shield, Adafruit ADA1438, arrived together with an Arduino Uno R3 board. The startup was done quickly as existing software could be used for this. It is the first time I have worked with the Arduino IDE interface. Still this goes very smoothly. Now I can test further how I can make everything work on the TXT Controller. I also bought a 17NEMA steppermotor to make tests. Now first learn to gain insight into the software. There is still a lot of work to be done because I also need to learn the C language to understand certain routines. But things are going pretty well already. always nice projects and great work from you. And well documentated! But you should create a new thread for new projects. The topic doesn´t really fit to the new projects and with different thread names it´s easier to find it for others. Bjoern hat geschrieben: always nice projects and great work from you. And well documentated! Yes I agree, from the next posting I will create a new topic. I try to place the motor drive shield on the TXT Controller via I2C to control 4 extra motors and also some stepper motors. this new motor driver project seems to be very interesting and I´m sure a lot of guys in the forum are interested in something like that.